Controlling your reaction to stress is the first tip on how to stress less at work. Your body’s natural reaction to stress is the fight or flight response. Internalizing this reaction to stress has major health implications. Have a plan of action to ensure a healthy response to stress. Take deep breaths and relax your shoulders to reduce body tension. Practice meditation and relaxation regularly so it’s easy to implement when needed. Take a walk as you brainstorm your response to a stressful situation at work. Working off some of the stressful energy helps reduce the impact of stress on your health. It’s also effective in clearing your thoughts helping you to resolve the issue. Identify the main projects and deliverables you are responsible for and block time on your calendar to focus on them. Ideally, schedule a recurring meeting with yourself to repeat every week. If your manager schedules over it or another meeting or project takes precedence, you are able to move the calendar entry to another time or day. Blocking your calendar also controls when you are available for meetings with your colleagues. Structure your day around when you are focused on your responsibilities and leave open the times on your calendar you prefer to attend meetings. Calendar blocking helps you to be more proactive with your responsibilities and increases your feeling of control which reduces stress. Productivity experts such as Brian Tracy, recommend making the first hour of the day laser focused on your most important activities. Arrive at the office earlier than everyone else to have focused uninterrupted time to work on projects, deliverables, and training. 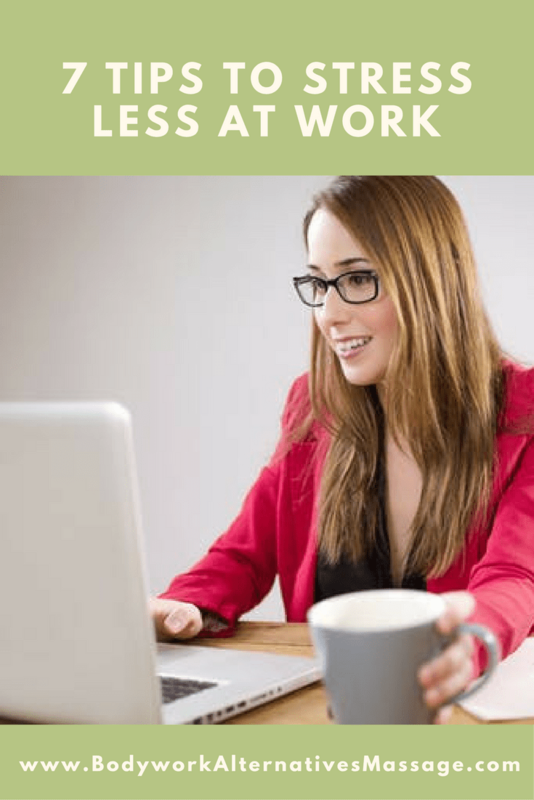 It isn’t required to be in the office for this to be effective, consider setting aside an hour at home every morning to get a head start on the day. Although it feels as if you are getting more done, skipping breaks leads to burn-out and distracting activities such as checking your phone. Take time away from your desk. Try taking a ten minute walk, eating lunch in the cafeteria, or sit to read or listen to music. Consider using your lunch break to work on a hobby. It will help you to feel balanced working in an activity that is important to you earlier in the day. If you are frustrated with your current position or feeling stagnant, learn a new skill. Find an online course or a class to improve an area you struggle in. Set aside time to read up on a certain subject. This is also a great way to use the hour you’ve set aside in the morning. Use the hour allocated every day or even set aside just one or two mornings for improving your skills. Prepare and organize the day before for the next day. Know your top priorities you’ll focus on the next day. Review your calendar for any new meetings you may need to prepare for. Draft out a plan for the next day to ensure maximized productivity. If you are juggling multiple initiatives, you might be struggling with completing everything expected. Discuss your assigned initiatives with your manager to prioritize your initiatives and set expectations with your manager on when they’ll be completed. For recurring tasks you’ve performed for quite a while and aren’t sure they are necessary, consider researching if they are still needed.